This is a note taking organizer that I have created to correlate with Open Court Unit 5, Week 6 story "Building the Transcontinental Railroad". 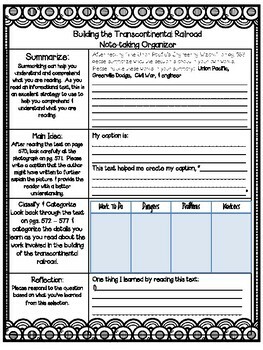 This notetaking organizer requires students to stay actively involved while they read the selection. Students will be utilizing a variety of comprehension skills throughout the close read including: identifying the elements of an informational text, comparing & contrasting, main idea, summarizing, classifying & categorizing, and comprehension. This is such an effective way to model your thinking aloud as you share the selection with your students. 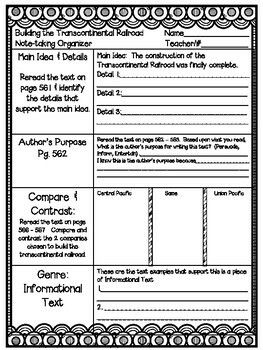 Students are required to analyze their thinking, dig deep into the text, and make personal and text connections. As you scaffold this activity, students begin to develop the characteristics of effective readers! Incorporating note-taking organizers into your weekly reading lessons provide your students with the framework to be readers who can tackle any text! After students begin to become efficient with close reading, this can become an activity that they complete independently in small groups. Upon completion of the group activity you may decide to take an additional class period and allow your students to "teach" the various portions of the organizer to the class. This is a fun way to assess students' learning! This note-taking organizer is a part of a larger bundle that you can purchase with all of the products I have created to correlate with this story. It is jam packed with everything you'll need to teach this story at a discounted bundled price. Please remember to leave your TPT credits if you purchase this to earn your free TPT bucks! Thank you for considering my products! A huge thank you to creative clips for the use of her amazing clip art on this product!